Winter sports enthusiasts have been warned that insurers are unlikely to pay out if they are unable to take to the ski slopes because of the extremely heavy snow in parts of the Alps. In France and Switzerland the amount of snow is close to the all-time record for the time of year, but snowstorms and the high risk of avalanches has forced some resorts to close the pistes. 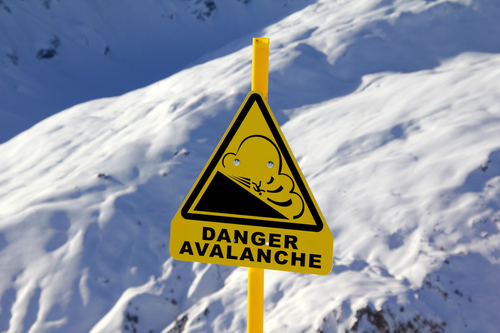 In the French resort of Tignes skiers were confined to their hotels and chalets as winter storms brought winds in excess of 200 km/h, while in the Austrian Tirol region two German skiers died in an avalanche on Friday. Some insurance companies such as Neckermann and Sunweb offer a package compensating skiers if there is not enough snow to ski, but the policy does not apply if the snow is too heavy. Holidaymakers who have to delay their journey home because of blocked roads or extreme cold may have a claim. ‘The weather for winter sports is so varied at this time of year that we can’t insure against it,’ said a spokesman for the ANWB, which operates Pharos Reizen insurance policies. Not all of the Alps is under a blanket of snow; in parts of Bavaria, on the northern side of the mountain range, spring-like temperatures of up to 12 degrees have been reported.